Brand Director (Jedi News). 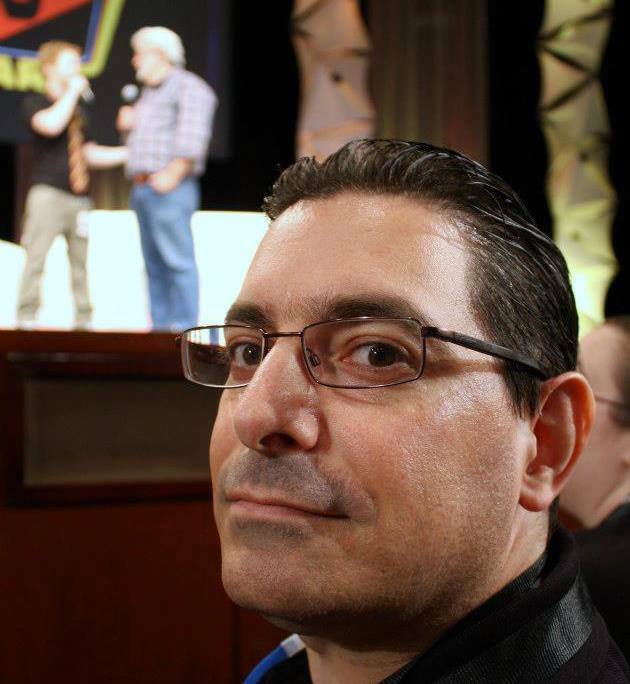 Host of Star Wars Collectors Cast and co-host RADIO 1138 (Jedi News Network). James was first taken to see Star Wars by his aunt when he was 6 and from then on he was hooked. His father supplied double-glazing to one of the workers on The Empire Strikes Back and James was rewarded with a signed Ralph McQuarrie Christmas card from George Lucas. His passion for Star Wars increased and by the time Return of the Jedi was released James was lucky enough to go to the premiere at the Dominion in London. As James grew up his fascination for all things Star Wars, including his favourite figures, dwindled. His collection of original loose figures and other Star Wars memorabilia were unfortunately destroyed in 1986. James got married in 1996 and thanks his wife for rekindling his passion in Star Wars. Sarah was an avid reader and was reading all of the new Star Wars literature being produced. James took an interest too and read the Heir to the Empire trilogy and consequently Sarah bought James a loose vintage Ewok Paploo in December of their first year of marriage; something she has come to regret, a little! Since 1996 James has eagerly collected the Hasbro line of 3 3/4″ figures, which are kept mint on card. Over the last few years his collecting habits have branched out to include items from Disney, EFX, Gentle Giant, JAKKS, Mattel, LEGO, Master Replicas, Sideshow and others. This has led to the building of an extension, aptly called the X-Wing, which has now been fully furnished and was featured in the BBC 2 programme Collectaholics. His collection contains almost 40,000 unique pieces. From 2003 to January 2007, James worked as news editor on UK site The Private Universe. During this time James was lucky enough to meet and get to know people from various UK licensees including representatives from Hasbro, LEGO and many others. He has also attended and reported from the UK Toy Fair and US Toy Fairs as well as attending numerous conventions on a regular basis and is widely known within the UK and international Star Wars community. He has attended Star Wars related conventions and events in Belgium, Denmark, France, Germany, Netherlands, United Kingdom, and the States (Atlanta, Dallas, Florida, New York and San Francisco). At Celebration V in August 2010, Jedi News and Mark Newbold's decade-old site lightsabre.co.uk merged to form a new entity, retaining the Jedi News name. During the weekend, Jimmy Mac and Jason Swank put James together with photographer/writer Dan Curto to co-host the Collector’s Edition podcast as part of The ForceCast. From September 2010 and for 18 months James co-hosted the show alongside Curto. The last of almost 30 shows as part of the ForceCast network was broadcast in early March 2012 and featured news from February 2012’s US Toy Fair. On April 1st 2012 Curto and Burns appeared on the April fool’s day 340th episode of Star Wars Action News, with special guest Steve Sansweet from Rancho Obi-Wan. The Curto Burns Collectors Cast ran from June 2012 to December 2013, featuring Steve Sansweet every episode. The show ended in December 2013 and continued under the new name, Star Wars Collectors Cast as part of Rebel Force Radio. Curto left the show in late 2014 and Burns continued alone along with regular monthly guest Sansweet. RADIO 1138 launched in November 2013 on the Rebel Force Radio feed and featured James and Mark Newbold talking about Star Wars events in the UK. In January 2016 both RADIO 1138 and Star Wars Collectors Cast were part of the launch of the Jedi News Network, later joined by literature show Take Cover and Galactic Fashion, focusing on fashion from across the galaxy. Since 2009 James has written for the Star Wars Insider, at first interviewing the stars from Star Wars and later writing the Incoming column since 2012 where he reveals the latest products from Star Wars licensees. In addition, he also wrote for DeAgostini’s Build the Millennium Falcon award winning part work, which included new canonical Star Wars content. James also contributes regularly to the blog at StarWars.com and wrote for the on-line blog at UK newspaper The Metro. James has appeared internationally on TV and radio and is a regular in the UK when new Star Wars news breaks. He has also written or been quoted in numerous UK newspapers. James was inducted into the 501st Legion as an Honorary Friend of the Legion at Celebration VI in Orlando by his friend Steve Sansweet, sponsored by Mark Newbold. At Celebration Europe II in Essen he was inducted into the Rebel Legion UK (Elstree Base) and at Celebration Anaheim was inducted into the Rebel Legion as a Friend of the Rebellion alongside Mark and The Force Awakens droid builder Lee Towersey. In 2016 James became an Ambassador for LEGO, making Jedi News an official LEGO User Group (LUG). James lives in London with his very understanding and supportive wife Sarah and their three children, Daniel, Jonathan and Miriam.